This is a sneak preview of Rifts® Coalition States: Heroes of Humanity. 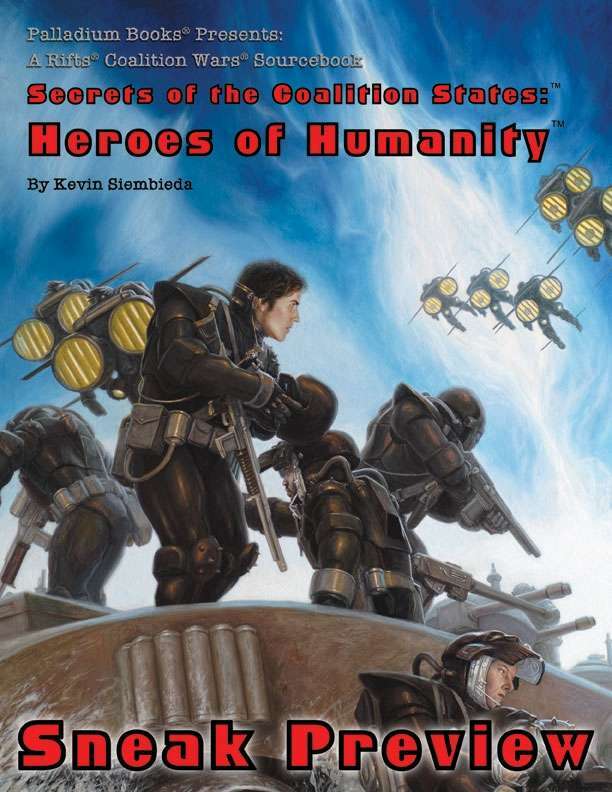 This sneak preview includes the front cover, credits, contents, author's intro, and excerpts from Call to Arms, Demonic Strategies and Tactics, Secrets of the Coalition, Shadow Allies, an overview of the Coalition Army in 110 P.A., Advanced Training, the complete CS Combat Courier O.C.C., the beginning of the Death Knight O.C.C., and Operation Hellbender. Rifts® Heroes of Humanity will be available in June, 2016. For more information, please visit our website. So when are we going to get the full book? I love all of Palladium book and can't wait to own this one as well. I will say I hope the full version is released on here the same day it's released physically. Looks good as far as sneak previews go. Can't wait to get the full book.